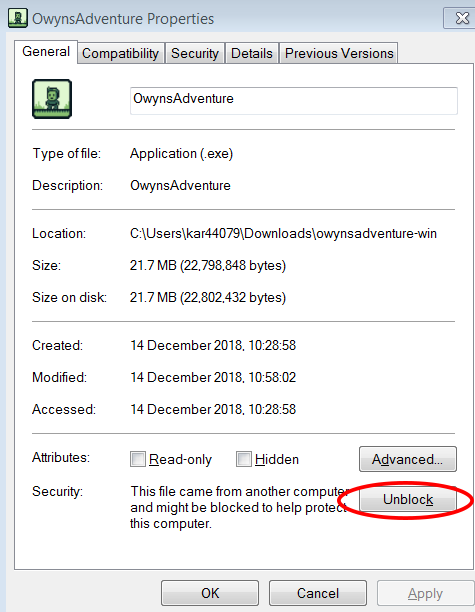 Owyn's Adventure community · Posted in Interested in publishing on Steam? Hi Deana, I have sent you an email with some questions. Owyn's Adventure community · Posted in Great game! Owyn's Adventure community · Posted in Fun game! Hello! Thank you for your kind words! I've just checked and you are indeed correct! There is no checkpoint after you get the last piece (whoops! ), I have now rectified this and it will be fixed in version 1.1 available in the next 10 minutes! Hello, Ah thats annoying! Yes I suspect defender doesn't recognise it. I had this issue at work. Hey everyone, I have just released my first solo game! I initially started it in September 2017 for the Unofficial Gameboy Jam, and after the Jam thought I'd spend "a couple more weeks on it"... it's been a labour of love in my lunch breaks at work, and I've very excited to present it to you today! It's a 2d side scrolling puzzle platformer in the style of the original game boy, roughly 25-35 minutes long. Thank you very much for your time! I hope you enjoy! Wrapping up the PC and Mac versions, and crunching out those darned bugs!